If you deal with sensitive data, conforming to the PCI DSS-compliance standards to safeguard your customers and protect your brand is a top priority. Data security is not just for large organizations — it is for companies of any size that process, transmit, or store credit card data or personal information. If your contact center isn’t compliant, you could damage your brand, jeopardize your customers’ trust, and cripple your business with extreme fines. Don’t lose your customer’s trust. 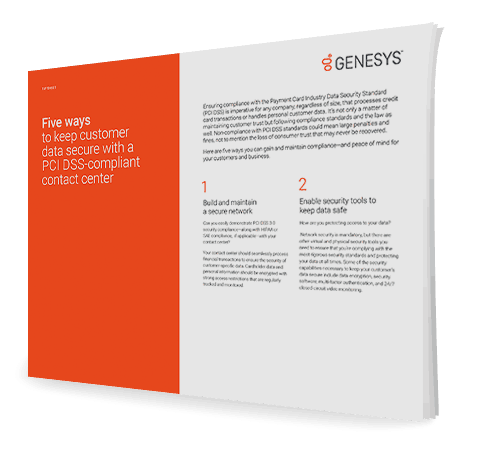 Download this tip sheet to learn five ways you can gain and maintain compliance—and peace of mind for your customers and business. GET THE TIP SHEET TODAY!